4717, Lorong Permatang Pauh, Off Jalan Permatang Pauh,13400 Butterworth, Penang, Malaysia. Started in 1999 in Butterworth, the company secured the rights to distribute and maintain the renowned Mitsui Seiki compressor in the northern region of Malaysia. Mitsui Seiki is distinguished for its oil free technology. With support from Mitsui Seiki that has extensive research and development in the international compressor industry, we have access to their expertise and hence well equipped to provide technical and design consultancy to the region. Early in 2006, the company decided to transform and expand the management by bringing together professional engineers, friends and business associates to include provision of professional engineering advisory services. We can now offer comprehensive range of services to suit the shifting market trend in the demand for maintenance services, particularly the fast growing oil and gas industries. The technical team is now managed by Mr. Tan Soon Tiong, Mr. Kenny Tang Sing Wei and Mr. Tang Chun Chai who are engineers in mechanical and electrical discipline with more than 20 years of industrial experience. Our current emphasis is to provide supply and maintenance to healthcare, food,electronic, oil and gas industries where oil free compressor application is paramount to the process. A part of our strategy is to look for smart partnership with bulk owners so that we can work as team to become partner in bringing out sustainable productivity and profitability. 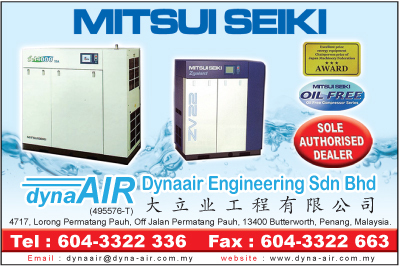 Dynaair Engineering has a paid up capital of RM100,000/- and is actively offering supply of equipments and parts as well as advisory and maintenance program with flexibility to customize to customer’s need in the northern region which is increasingly industrialized and prudent in cost management to tackle both the local and global competition.